One of my New Year’s resolutions was to get more organized, declutter and get creative with what I have on hand (whether it’s new clothing combinations or craft and needlework supplies). 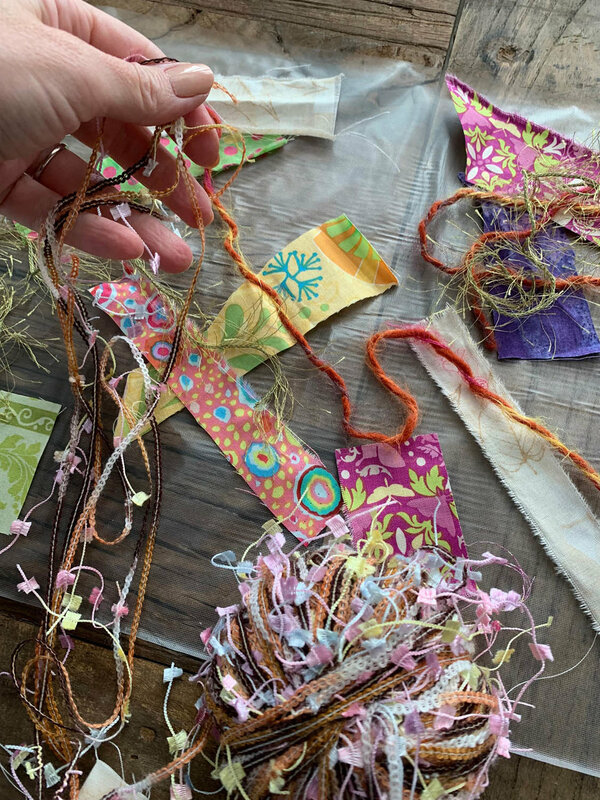 So in thinking of ways to upcycle things I have around the house, I came up with this idea for using scraps you likely already have in your stash. 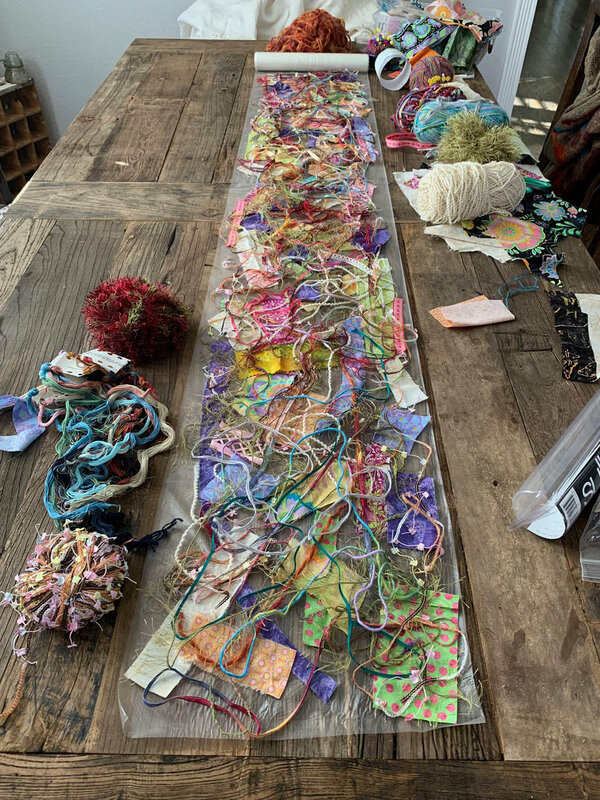 Whether it’s bits of fabric, yarn, or thread—so many things that you may normally toss when doing a project—you’ll likely find that you already have much of what you need for this scrappy runner! 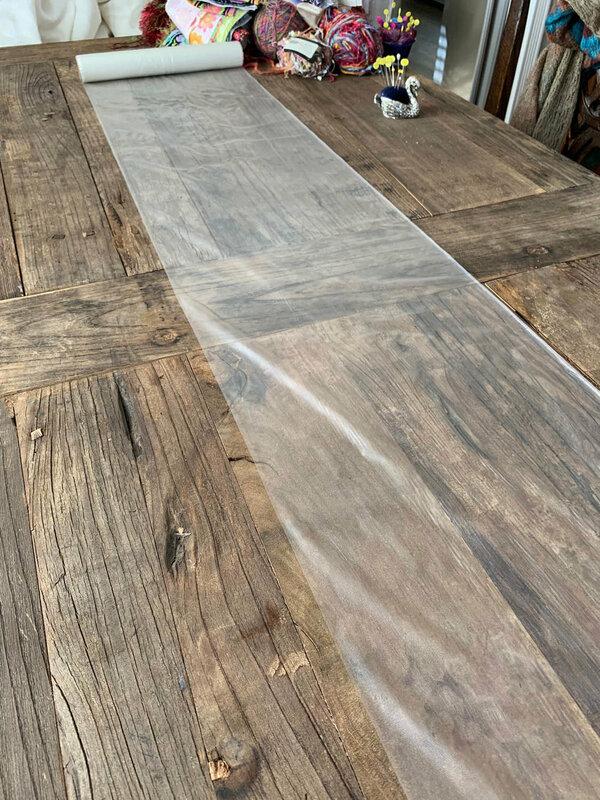 I made a table runner for my first attempt at this process but you could also make place mats or a small project to frame or hang on the wall. 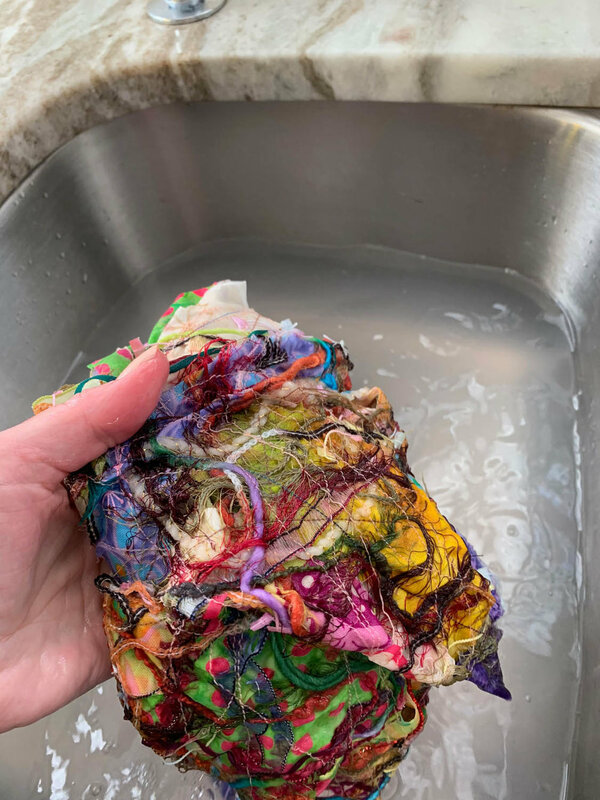 Mine turned out really pretty and it felt so rewarding to have used up all these little bits of fibers and fabrics that would normally be tossed. 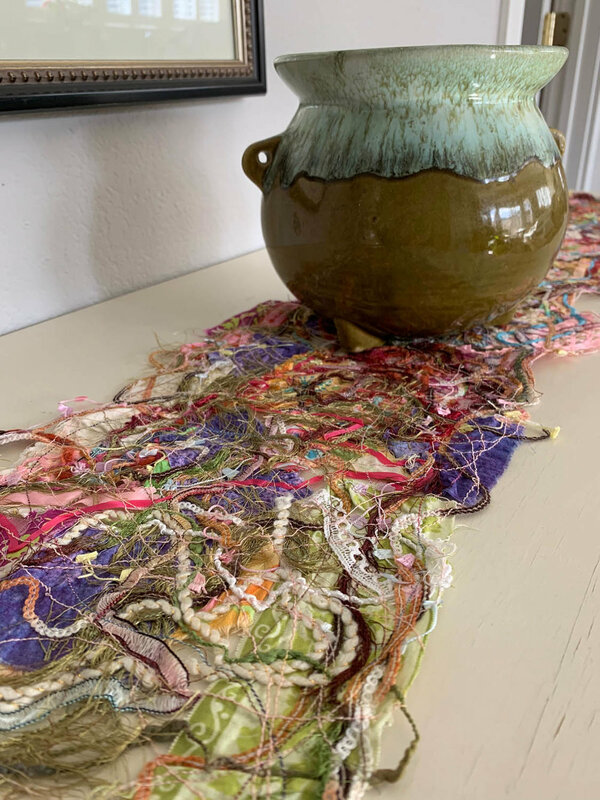 It adds color and creativity to a basic Pottery Barn sofa table and I just love the textures created by fabric, ribbon and thread. This project is EASY since you’ll need minimal supplies, the main ingredient being a water soluble stabilizer. I used a product by Sulky called Solvy, and found it so easy to work with. The design process of this project is the most fun, since you can play with different colors and textures and move things around until you are happy with the combination. Use your creativity and remember that there’s really no way to mess this up as long as you follow the easy instructions. Now my problem is that I’ll want to save ALL of my bits of scraps and threads to use in future projects. I think I’ll keep a plastic bin of these leftovers to recycle! Ready to try this fun technique? Decide the width and length of your desired finished project. Cut two pieces of water soluble stabilizer (Solvy) the desired length. I purchased the stabilizer in a roll 12” wide x 9 yards long and felt the roll was the best value and easiest to work with and left me with extra for future projects. Lay out a strip of stabilizer on a table or the floor. Gather all shapes, sizes and textures of fibers and fabrics for layering. Place scraps to cover your desired length, making sure that each bit is touching another bit and that there are few gaps. Carefully place a second layer of stabilizer on top and make a sandwich. Pin your layers together using lots of pins to hold in place. Using heavy quilting thread in the color of your choice, begin stitching at one end of your project. I stitched and doodled all over the project, trying to make sure each remnant was stitched in place before removing a pin. You’ll use a lot of thread and it takes some time to cover the entire project. Now for the fun part! Fill a bowl or sink with warm water. 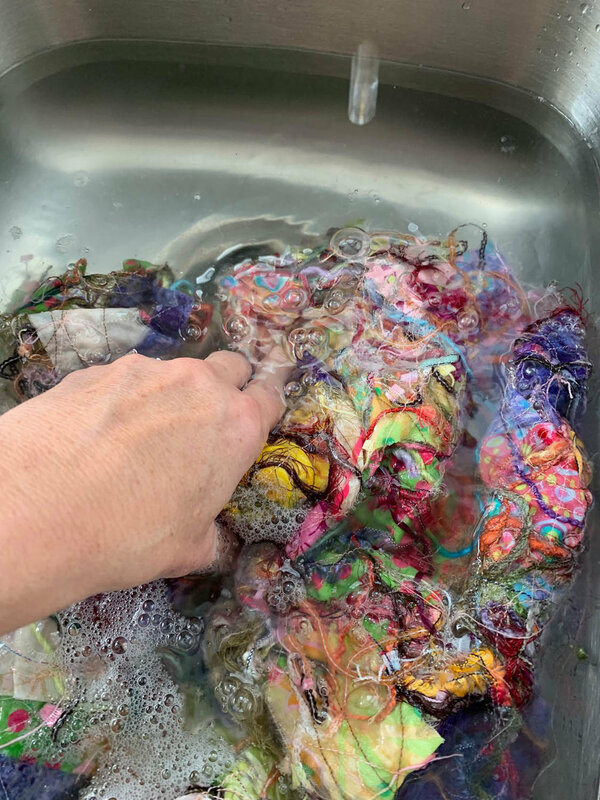 Place your finished piece in the water and begin to rinse your piece. It’s like magic to see the stabilizer disappear and your fibers start shining! Rinse well and gently squeeze water out. Lay flat to dry. 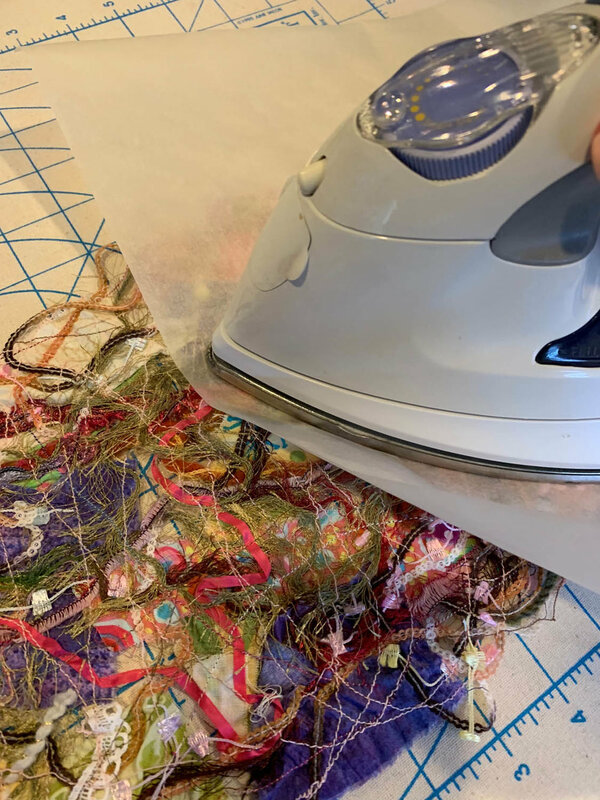 Using a warm iron (not too hot since some fibers may melt) and parchment paper, press your piece of fabric artwork. What do you think? Wasn’t that a fun way to upcycle some remnants from your sewing room? Do you have any fun upcycling projects to share? I’d love to hear about them and see photos too!